With the design and support in California, Nulock has achieved a rank of #1 in Ezvid Wiki of 2018's Best Smart Bike Locks. Search "Nulock"video review in Youtube to find it out how it works! 1. It "knows" you. When your cellphone is in its bluetooth range, you can unlock it by pressing the unlock button. 2. It "reminds" you about the battery level or "notifies" you when bluetooth is connected or disconnected. 3. It "deters" destroyer. If your cellphone is NOT close by or bluetooth turned OFF and Vibration ON, it will make a 110db alarm if any stranger tries to break, disassemble the unit, remove battery or clip the cable when it is locked. -Cable Diameter:0.4", Length: 47" (The longer cable recommended for motorcycle, two wheels or multi-bike locking). 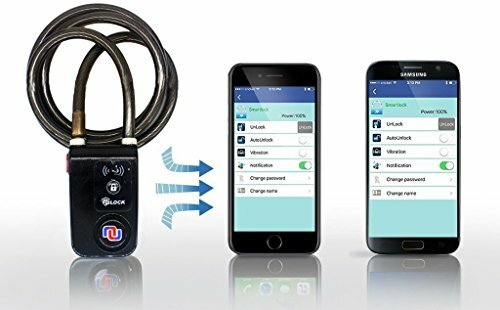 -Vibration (Alarm) On: When the owner's phone is not in bluetooth range or turns off bluetooth, the lock will beep once if it detects any tampering. If the tempering continues, 110dB alarm will keep going off for 30 seconds. *1:This is a bluetooth device. So if you want to control the lock from another phone, please make sure its bluetooth is turned on and no other phone is paired to the device. *2: The battery cover needs to get screws in and press the lock button before adding or connecting the device to your phone and get alarm to work. *3: The alarm works only when your phone disconnects with the lock on bluetooth and the Nulock is locked. Please connect to the app to disalarm. *4: If your phone can not detect the lock, try to use another phone to unlock your lock or contact Nuvending for support. CONVENIENCE: keyless, no combos, Apps work for Both iOS and Android (iPhone 4s and above - Android 4.3 with Bluetooth 4.0 above). ROBUST: 7 braided steel (each is made of 19 braided steel) combined with rust-protective vinyl increase cut resistance for a long time use. Braided Cable is 0.4" in diameter and 47" in length works for mulitple bikes locking, motorcycle, gate, garbage can, patio grill, outdoor furniture, propane tank, recreational or emergency generator locking etc. LONGEVITY: 3 "AAA" batteries are required which lasts for 8 months use (Opened twice, daily). Low battery indicator in the NuLock App will warn you low battery when power is less than 20%. If you have any questions about this product by NUNET, contact us by completing and submitting the form below. If you are looking for a specif part number, please include it with your message.